I thought it might be prudent to give a status update on how The Headlines Project is fairing. We're 3 headlines in. We started with Publish All Weddings; an exposition on love, and how society (including businesses) refuse to acknowledge it, regardless of its legal status. Publish All Weddings went fairly well, even though it was rushed. I hadn't planned on starting as early as I did, but the issue was important enough to do so.. And thankfully, there was a positive response. Plenty of people read the post, asked questions, and voiced their support. The naysayers did exist, however; Dirty looks weren't far and few in between. I made sure to make myself seen in a variety of locations. A local furniture store voiced it's support, and we talked about the project at length. Customers at a local diner, however, proceeded to silently seethe once they read the headline. The second was less controversial; "I Don't Work For Free" was a piece on the devaluing of the work of creative professionals. This one got some "Hmm, I never thought about that" responses, others just chuckled a bit. Metered responses from both sides. Still, it was a personally significant issue for me, so I was glad to share it. The third, however, drew the greatest response.. Including in one place I hadn't expected. 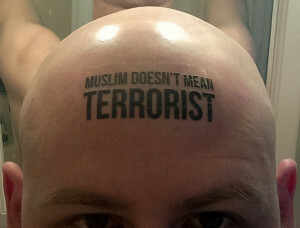 The "Muslim Doesn't Mean Terrorist" headline had the desired effect, to be sure. Plenty of people agreed. People gave me disgusted looks. People asked questions. I decided to run a Facebook ad for it. The issue is heated enough, contested enough, that I thought I might be able to actually reach more people and help foster change. My budget was slim, but my copy was right. Attracting a few more eyeballs and encouraging them to share was all I needed. Facebook denied my ad, based on violating ad standards. The section they pointed me to only had one thing that was remotely close to being the reason; Inflammatory copy. That's right; Facebook's ad inspectors have deemed a post about stopping hate to be too hateful to publish. I don't blame Facebook itself; most likely it was the poor decision of some ad inspector being rushed to approve or deny ads as they come through. Still, it bothers me. If I were a major news organization, or a well-known politician, they most likely would've gladly taken my money. Instead, because I am a lowly artist/blogger, I didn't warrant a close enough inspection. If you'd like to help, share this post, and the others. Get the word out. There are plenty more headlines in the future, as there are always important issues that warrant attention.